The audience consisted of medical interpretor students. Afterwards we had a book signing for both of the books PRIDE. 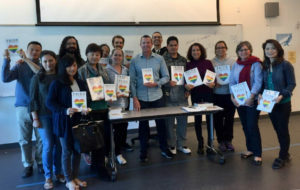 Creating Safe Spaces for the LGBTQ College Community: An Experiential Learning Perspective for Students. 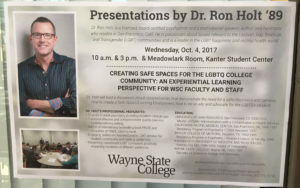 This presentation was part of a diversity lecture series sponsored by PRIDE, WSC Counseling Center, President’s Council for Diversity, and the Multicultural Center. The audience consisted of students, resident assistants/housing staff, and the public. The audience consisted of students, faculty, and community members. 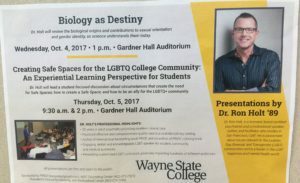 The Biology as a Destiny presentation helped audience members compare and contrast the definitions of sexual orientation and sexual behavior; describe the spectrum of sexuality in the general population; identify that sexual orientation is not a choice; describe how genetics plays a role in male homosexuality; list the current biological theories on causation of male homosexuality; and identify neuroanatomical differences between homosexual and heterosexual men. Dr. Holt’s comments: The information presented in this talk points to a multifactorial causation of male homosexuality: A combination of genes, hormones, male birth order and epigenetics. We all fall on a gender spectrum with most of us identifying as either male or female. Anatomy does not define our gender identity. 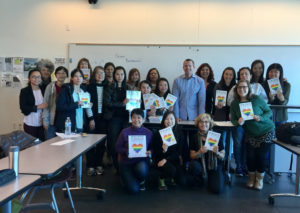 The presentation consisted of reviewing LGBT student case scenarios through small breakout groups, which allowed an experiential learning perspective. After discussing a particular case as a smaller group, the group would present the case to the whole audience with Dr Holt as the facilitator. 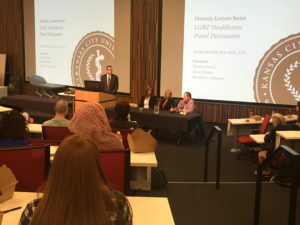 The panel presentation was part of a diversity lecture series sponsored by the Advocates for Diversity in Medicine (ADM) student club. A panel representative of the LGBTQ community discussed their healthcare experiences and obstacles to receiving culturally competent care. Dr. Holt served as the panel’s moderator and assisted with audience questions. 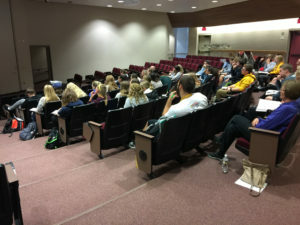 The audience consisted of first and second year medical students, faculty, staff, and bioscience students.